What’s included in the deal? A surcharge may apply for travel on a Friday and Saturday. Packages are subject to availability at the time of the reservation. Passport & visa costs (if applicable), travel insurance & items of a personal nature are not included. Prices are subject to change without prior notice due to airfare increases and currency fluctuations. Rebooking and cancellation fees apply. All prices are per person sharing unless otherwise specified. Standard terms and conditions apply. All discounts and/or special offers have already been included in the package price. 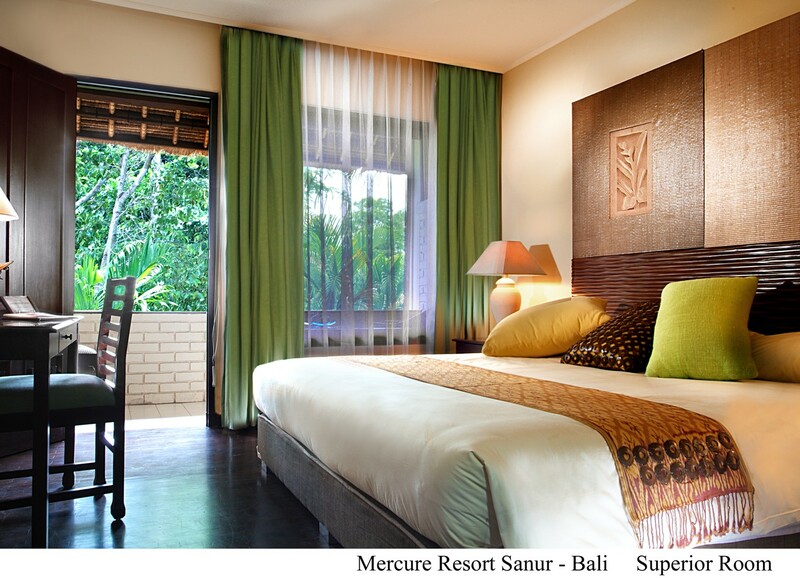 Mercure Resort Sanur’s guest rooms are divided into traditional cottages surrounded by 5 hectares of tropical gardens and one of Bali’s most beautiful, calm and white sand beaches. The 189 guest rooms are divided between 41 traditional style, 2 storey cottages and all offer a private balcony or terrace overlooking the gardens. Located in the cottages, Superior rooms feature a private balcony or terrace overlooking the tropical gardens. The en suite bathroom has a rain shower. Up to two guests may be accommodated in this room category. 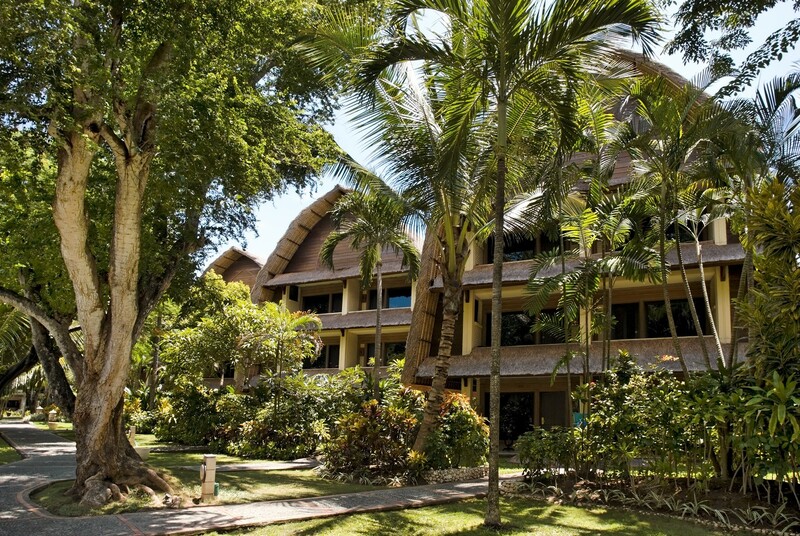 These rooms feature a private balcony or terrace overlooking the tropical gardens. The en suite bathroom has a rain shower. Up to three guests may be accommodated in this room category. All day dining restaurant offering buffet breakfast and à la carte lunch and dinner with an Asian and Western flair. Relax, enjoy a cocktail and savour an idyllic moment along the beachfront. 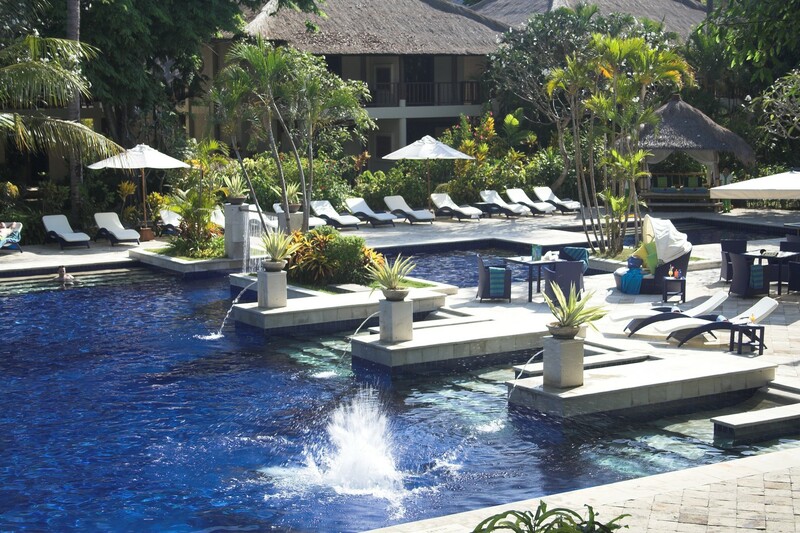 Enjoy a refreshing drink next to the swimming pool. With 2 open air rooms and 7 standard treatment rooms MySpa at Mercure Resort Sanur offers exciting rejuvenating experiences to choose from. Available throughout the resort free of charge. Bali is so picturesque that you could be fooled into thinking it was an artistic masterpiece: rice paddies roll down hillsides, volcanoes soar through the clouds, the forests are lush and tropical, the beaches are lapped by the warm waters of the Indian Ocean and in the villages you’ll notice the quietness and wisdom in old people’s faces. Over 20,000 temples and palaces, coupled together with colourful festivals, music and dance is testimony to the island’s rich heritage. Kuta Beach – first discovered in the 60’s, and once a sleepy fishing village - has now transformed into the centre of Bali’s nightlife and action. Legian is where the locals, tourists and expats all mingle. 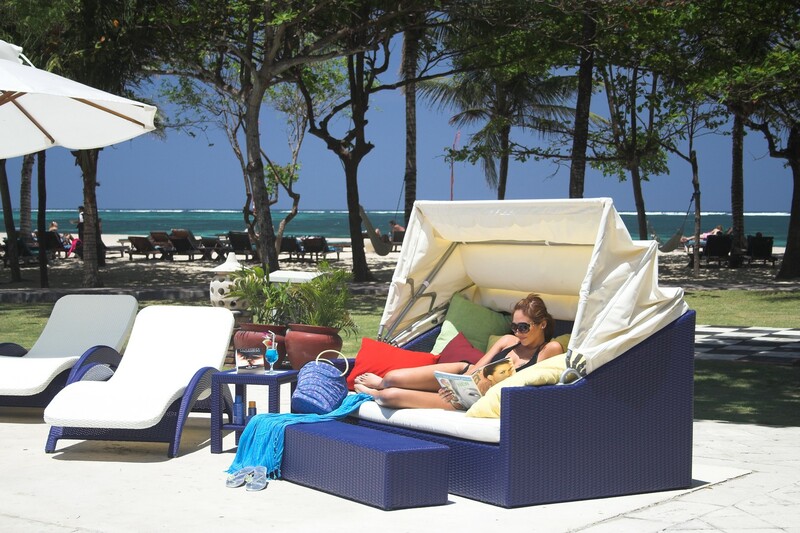 Bargaining, beach activities, indulging in massages, meditating or simply reading - you name it, it’s available! 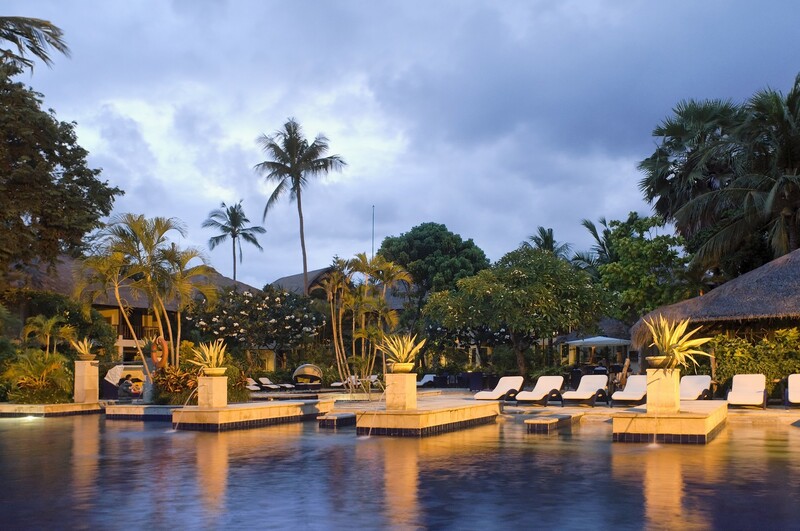 For a holiday where the emphasis is on relaxation, visit Jimbaran or Sanur Beaches; whilst Nusa Dua caters for the more upmarket taste and is ideal for families and water sport enthusiasts. If beaches aren’t your ideal, then visit Ubud, where the culture and lifestyle of the Balinese wait to be discovered. You will find a range of chauffeur driven limousines, self-drive cars, taxis and hotel shuttles. Many taxis are not metered so it’s wise to negotiate the fare beforehand. Bemos, or communal buses, are available in smaller villages - simply hail the driver and negotiate the fare that suits you both. Motorcycles can also be hired but road and traffic conditions can be busy and somewhat hazardous in certain locations. Bali has a tropical climate with temperatures averaging 30°C year round. October to April can bring heavy showers and high humidity, but usually the days are sunny. From May to September the humidity is low, and it can be quite cool in the evenings. Indonesian is the official language known as Bahasa Indonesian but all the Balinese people also speak Bahasa Bali (Balinese). English is spoken in tourist areas and is the common "third” language of Bali. Light, airy, casual clothes are the most practical and you’ll find cottons or linens are the most comfortable in Bali’s often humid conditions. Pashminas or shawls and waist sashes should be worn when visiting temples. A warm sweater or light jacket can be a good idea in the mountain interiors. Most hotels use 220 volts, 50 cycles and a round, two-pronged slim plug. Shorts or revealing clothing are not allowed in religious places. The head is considered sacred and should never be touched. Hand shaking is common practice but avoid using your left hand for handshakes or giving / receiving anything. Public displays of affections between men and women are deemed inappropriate. Like anywhere in South East Asia, calmness is admired so ‘keep your cool’ when bargaining or if things are not running according to plan. Visitors do not require vaccinations unless coming from or passing through a designated contaminated area. Drink only bottled water and avoid ice unless you know it is made from bottled or boiled water. Be cautious when eating from the food vendors on the street and proper care must be taken against sunburn. The currency is the Rupiah which is better for bargaining and shopping in markets but US Dollars, Pounds and Euros are accepted at hotels. A service charge is already included in all prices. Tips, in general, are not mandatory, and you should only give them if you are really content with the service offered. Bali is 6 hours ahead of South Africa. Climbing a volcano, canyoning, downhill cycling, or a hike through traditional villages will you get you closer to nature and Balinese Culture. Ubud should be on your itinerary – it is indeed special. Bali is a shopping paradise; art work, handicrafts, oils and essence, clothes, shoes, furniture, accessories – you name it. There is surfing for beginners at Kuta, Legian and Seminyak Beaches. Water sport activities can be found at Benoa (jet skiing, paragliding and water skiing). Whatever your age or interest, you will be sure to find plenty to keep you busy. As a guide, the maximum weight for checked luggage is 20kg in economy class. Travel insurance is a must. If you can’t afford it, you can’t afford to travel! Travelling with kids – please check that you have all the relevant documents including unabridged Birth Certificates. Be patient, be flexible, be spontaneous and have the best time ever! Thank you for your enquiry. A consultant will be in contact with you. Copyright © The Holiday Factory. All rights reserved.